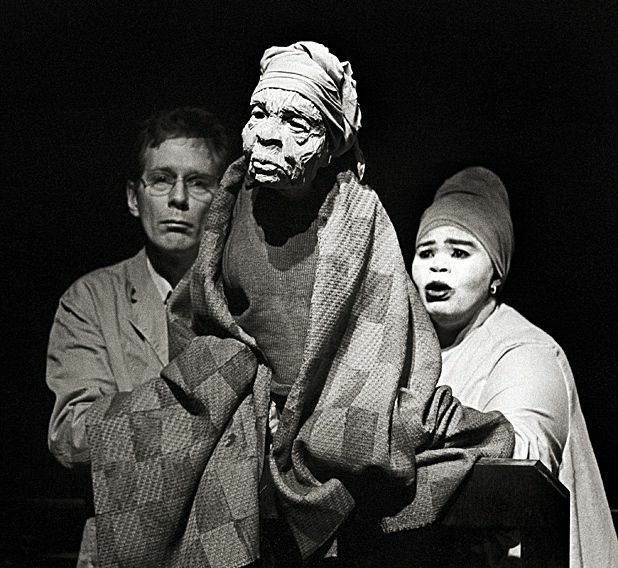 A revival of the 1997 production that mashed up Alfred Jarry's anarchic satire Ubu Roi and episodes from the Truth and Reconciliation process in the aftermath of the dismantling of apartheid in South Africa, Ubu and the Truth Commission is an entertaining and chilling reflection on the abuse of power – and how guilt is not always enough to drive away the demons. With Ubu stomping about the stage in his grubby white under-garments, and his henchmen represents by a three headed hound, Handspring's production unwinds the levels of deceit, and self-deception, that allowed men to commit brutality and ignore its consequences. The structure alternates between the tale of Ubu and his wife and interludes from the Truth and Reconciliation Commission. Animated episodes reflect the actions on-stage – sometimes providing depth (as when Ubu's shower is shown with the blood and body parts being washed away), other times illustrated the speeches – the powerful montage of atrocities. While this, and the puppets that are Handspring's trademark, gives the plot a specific historical context, the action feels dwarfed by the Lyceum's large stage. Politically, Ubu covers no unsurprising ground. The horror of apartheid is recalled, and the speeches culled from the Commission are heart-rending and harsh. Ubu himself is familiar, a self-justifying tyrant who survives without ever being sympathetic. He is funny, but has no redeeming features. This is a pessimistic vision of power, especially when Ubu survives to fight another day: if reminders of the past are necessary, Ubu becomes a historical documentation rather than a living dialogue or challenge to its audiences. The third piece in a trilogy of plays revived to celebrate 20 years of democracy in South Africa. Directed by William Kentridge and brought to you by the company behind the stage phenomenon War Horse.